Lot of 77 different autographed 2002 Upper Deck regular issue and insert (no silver parallel) golf cards (various pens) including dozens of cards autographed by major winners: 3 Gary Player (Legends, Chip Shots and Green Room insert), 3 Mark Calcavecchia (regular, Leaderboard and New World Order), 2 Stewart Cink (regular and New World Order), 3 Lee Janzen (regular, Chip Shots and Checklist), 2 Bernhard Langer (Chip Shots and Leaderboard), 2 Tom Lehman (Leaderboard and regular), 3 Justin Leonard (regular, Leaderboard and Green Room insert), 2 Mark O'Meara (regular and Leaderboard), 2 Corey Pavin (regular and Leaderboard), 3 Nick Price (New World Order, Chip Shots and Leaderboard), Jeff Sluman, Curtis Strange, Mike Weir (Green Room insert) and Ian Woosnam. 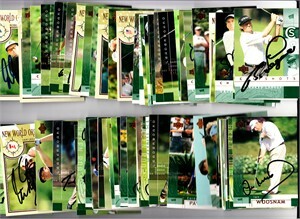 Other notables include Chad Campbell, Paul Casey, Chris DiMarco (3 different), Luke Donald, Shingo Katayama New World Order, Matt Kuchar Green Room insert, Shigeki Maruyama (regular and New World Order), Rocco Mediate (regular and Chip Shots), Steve Stricker (2 different) and Hall of Famer Colin Montgomerie (New World Order and Leaderboard). All autographs obtained in person at various PGA Tour and Champions Tour events, with certificate of authenticity from AutographsForSale.com. Cards average NrMt to NrMt-Mt condition. ONLY ONE LOT AVAILABLE FOR SALE.